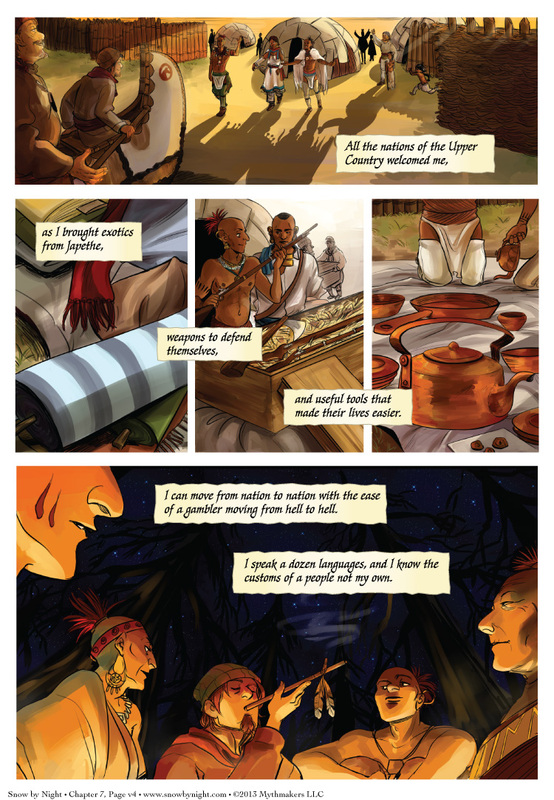 Peyre and the other voyageurs reach the nations of the Sweet Seas (the Great Lakes) in Page 4 of A Life So Free. To see a preview of the next page (and some doggies! ), please vote for Snow by Night on Top Web Comics. The SpiderForest comic of the week is Chirault by Thane. This fantasy comic about curses, demons, and the imminent end of the world started in 2007 so there’s a vast archive. Plenty of entertainment for you! Ahhh dammit. I finally got to read thru this and now I’m out of pages frrrrriiiiccck. :( so good, wish I hadn’t put it off for so long now! I feel bad tho cos I plowed thru the archive in two days xD; (reading before bed haha) 3 YEARS OF WORK IN 3 HOURS, bam gone. Thank you, hchano. I’m glad you enjoyed it. We’re making more pages for you as quickly as we can. *cracks whip on Brittany* Draw faster, artist! Lol, all this says to me is that he enjoys bragging about the multitude of reasons why married life isn’t enough for him. Pretty much rubbing it all in her face.